3 Passes Trek is one of the most challenging treks in the Himalayas requiring good physical fitness. It involves crossing over three highest passes in the Himalayas, namely Renjo La (5,388m), Cho La (5,380m) and Kongma La (5,535m) along with a memorable trek to Everest Base Camp (5365m) and Kala Patthar (5550m). Kala Patthar offers one of the most unparalleled and majestic views of Mt. Everest (8848m) and Khumbu Glacier. Everest High Passes trek also gives you an opportunity to visit the Gokyo Valley that is home to Gokyo Ri (5483m), the turquoise Gokyo Lake and visit Ngozumpa Glacier, one of the largest glaciers in Nepal. Along the way enjoy Sherpa hospitality and culture, visit monasteries and mani walls and pay tribute to Tenzing Norgay Sherpa(The first Everest climber) by visiting Thame, the village where he was born. Highlights: Thrilling air journey to Lukla. 04.30 am: Breakfast at your hotel. 05.00 am: Pick up from your hotel to airport. 05.30 am: Arrive in Kathmandu’s domestic airport to catch your flight to Lukla. 06.30 am: Fly to Lukla (2840m). 07.00 am: Arrive in Lukla airport. Collect the luggage and prepare for the trek. It will take around 30 minutes to come out from the Airport. Breakfast in Lukla. And, start your trek after breakfast. 08.00 am: Start trek to Chheplung (2660m) for two hour. Note: You will see Kusum Khanguru Peak on right hand sight. 10.00 am: Arrive in Chheplung (2660m). And continue the trek to ThadoKosiGaon(2580m). Continue the trek to Ghat (2590m) for 1 hour. 11.00 am: Arrive in Ghat (2590m) and continue the trek to Phakding (2610m). It will take about 2 hours. You will see beautiful green hill during the trek. 01.00 pm: Arrive in Phakding (2610m). Rest & Relax. Highlights: Scenic Mountains and amazing Namache Bazar. 08:00 am: Start the trek after breakfast to TokTok (2760m) for 1 hour. 09.00 am: Arrive in Toktok(2760m) and continue the trek to Bengkar(2710m) for 30 minutes. Note: You can see Thamserku(6618m) mountain on your right hand sight. 09:30 am: Arrive in Benker(2710m). From Bengkar, you can see the view of Thamserku(6618m) on front right. Continue the trek to Monjo(2840m) for 1 hour. 10.30 am: Arrive in Monjo(2840m). You can see the Khumbila Peak(5765m) from Manju. Buddhists believe that it is the holy Himalaya and restricted to climb. NOTE: We will registered and buy the Sagarmatha (Everest) National park entry permit here(Included in fees charged), we then continue the trek to Jorsalle (2810m) for 30 minutes. 11.00 am: Arrive in Jor Salle (2810m) and lunch. 11.30 am: Start the trek after lunch to Hilary Bridge for 40 minutes. 12.10 pm: Arrive in Hilary Bridge and start uphill trek to Namche(3440m). Will test your fitness. 03.00 pm: Arrive in NamcheBazar(3440 m). Check in hotel, Enjoy the scenic Namche Bazar and splendid view of Kongde(on front), Kusumkhan and Thamserku(at back). Dinner and overnight in Namche. Hiking to Everest View hotel 3900m. It is 2.5 hrs uphill treks. Rest and explore the area. This point offers beautiful views of Kwangde, Thamserku, KusumKanguru, Kangtega, AmaDablam, Island Peak, Peak 41, Lhotse, Lhotse Shar, Nuptse, Everest, Tabuche peak, Cholatse peak, Khumbila etc..
NOTES: Back to hotel. Breakfast, lunch& dinner in hotel. NOTES: Every Friday and Saturday, do not forget to visit the local marker fair to shop for goods on cheap price. 08.00am: Check out and start trek to Thame Village. Note: It is the birth place of Tenzing Norgay(First Nepalese Everest Climber ). This is the trade route to Tibet over the Nangpa la Pass. 09.00am: Arrive in Phurte village(3390m) and continue the trek to Thamo(3440m). You can see the good view of kwangde Peaks. After continuing the trek, you can see a beautiful village in front, that is Thamo. On the way you will see monasteries which is very popular with tourist. 11.00am: Arrive in Samde(3580m) and you will have tea break. You can see the beautiful view of Kwangde and Tengkangboche mountain from here. 11.30am: Continue the trek to Thame(3820m). It is uphill trek, demands some physical fitness. Note: Lunch and dinner at the hotel. You can explore the Thame Village on free and easy time. You can see the mountain like Kwangde Peaks, Tengkangboche on the east side you can see Thamserku, kangtega and Kusum Kanguru etc. Thame is beautiful village with lots of Monastries and Buddhist people. You can visit Tenzing Norgay’s home on free and easy time. 08.00am: Check out and start trek to Lumde Village. You will walk through riverside trail. 10.30am: Arrive in Taranga. And continue the trek to Marlung(4210m). 12.30am: Arrive in Marlung. Lunch in Marlung in local tea house. 01.00pm: Start your trek to Lumde village. 03.00pm: Arrive in Lumde Village and continue the trek to Lumde Village. Today, is the rest day. You will have free and easy time. You will trek nearby areas and some uphill for pass preparation. Breakfast, Lunch and dinner at the hotel. 05.00am: Breakfast at the hotel. 06.00am: Check out and start trek to RenjoLa Pass with plenty of waters and lunch. Rocky and snow covered trail with long glacier routes takes you to the summit of the RenjoLa Pass. Note: It is steep uphill Trek. 10.30am: Arrive at the top of the Renjo La Pass(5360m). Enjoy the view of Mt Everest and Gokyo Valley. 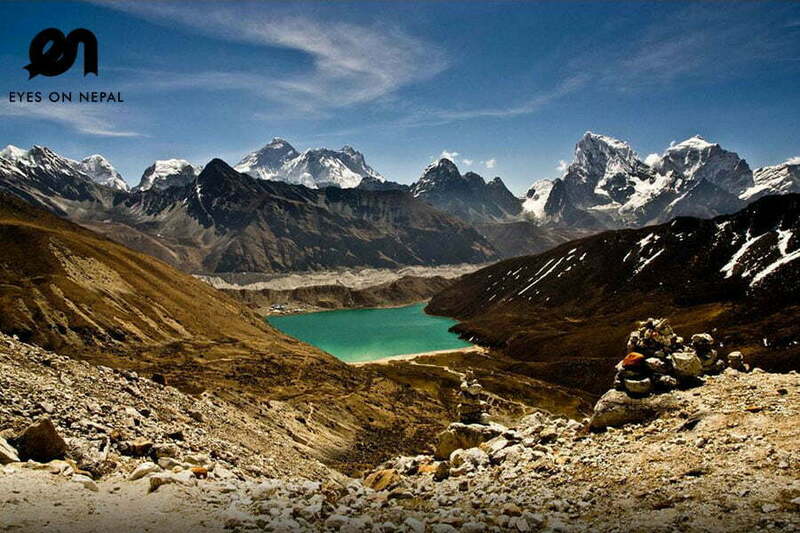 After taking some photographs and spending sometimes we continue our trek to Gokyo. 01.45pm: Arrive Third lake of Gokyo and after some time you will be check in your hotel. 02.15pm: Check in hotel. Note: Dinner at the hotel. Rest and Relax. Congratulation you have crossed first pass of the trip successfully. 08.00am: We start our trek to Fifth lake. 09.00am :Arrive in fourth lake of Gokyo (Thonak Tso 4870m) and continue the trek to fifth lake. 11.00am: Arrive in fifth lake of Gokyo(Ngozumba Tso 4998m). You will see amazing views of North and South slpes of Everest. You will see the trail that extends towards Cho Oyu Base Camp at the fith lake and views of longest Glacier in Nepal called Nogunzpa Glacier. After spending some times by taking some pictures of lake, glacier and Everest, you will return to hotel. 02.00pm: Arrive in Hotel. NOTE: Lunch and dinner at the hotel. 05.00am: Start the trek to Gokyo Ri. 07.00am: Arrive at the summit of Gokyo Ri(5357m). You will see the view of Cho-Oyu, Gyachung Kang, Everest, Lhotse, Nuptse, and little bit of Mt. Makulu . After taking some picture we trek back to Gokyo lake. 08.30am: Arrive in hotel and have your breakfast. 09.30am: Start your trek to Tragnag. 12.00am: Arrive in Tragnag and Rest and Relax. NOTE: Lunch and dinner at the hotel. Highlights: Experiencing the second pass of the trip. 06.00am: Start the trek to Chola Pass along the rocky trails and glacial moraines to the top to the pass. The final 300 meter up to the Chola Pass is difficult and technical walk. So, please listen and follow the instruction of your guide carefully. 09.00am: Arrive at the top of Chola Pass. You can see the amazing view of mountain and passes from here. After taking some photographs we continue our downhill trek to Dzangla. 01.00pm: Arrive in Dzangla and stay overnight at local lodge at Dzangla. Note: You may find slippery icy downhill trek. 06.00am: Breakfast at the hotel. Check out hotel. 07.00am: Start our trek to Lobuche. After some easy downhill and few up and downhill walking along rocky trail, you will arrive at Lobuche(4910m). 01.00pm: Arrive at Lobuche, check in. NOTE: Lunch and dinner at the hotel. 06.00 am: Breakfast at the hotel. Check out hotel. 07.00 am: We start another long day trek of our jouney. You will walk along rocky trails.During your trek to Gorakshep you will see amazing view of Mt. Everest,Mt. Nuptse,Mt. Pumori and Khumbu Glacier. 10.00 am: Arrive in Gorakshep(5164m). we will drop our backpack at the hotel. After some light meal we will continue our trek to Everest Base Camp(5365m). 03.00 pm: Arrive in Everest Base camp. You will see the amazing views of Nuptse, Khumbuste and Mt. Pumori. Take the picture and feel yourself how nice it would be if you can trek further up to summit. After spending some memorable times, we will trek back to Gorakshep. 06.00 pm: Arrive in Gorakshep. Dinner at the local lodge. Have a good night rest after dinner. 04.00 am: Wake up and uphill trek to Kalapatthar (5545m) for 2 hours. Note: You can see beautiful sunrise view and mountain likes Everest, Nuptse, Mt Pumori, Amadablam etc. We will rest for 30 minutes. Heading down now, the going is easier and the pace faster. Take back great memories with you and walk down hill towards the Pheriche. 06.30 am: Start downhill trek back to GorekShep(5170m). Heading down is easier and the pace is fast. You will walk with great memories and good feelings. 07.30 am: Arrive in Gorakshep and have breakfast at your hotel. 10.30 am: Arrive in Lobuche (4940m). Rest and Relax after hard trek in early morning. Note: Lunch and dinner at the hotel. Highlights: Crossing the most difficult pass of the trip: Kongma La pass(5530m) . 06.00am: Start the trek to Dingboche Village(4360m) through Kongma La Pass. This is most toughest day of the trek because of the long walk and pass. Trail can be easily miss if guide is not enough experienced because of the heavy snow fall on the trail. There is no place for the lunch in between Lobuchhe village and Dingboche village(4360m). So we will carry it from the hotel at Lobuche. View is amazing on the trail and from the top of the Kongma La pass. 11.00am: Arrive at the top of the Kongma La Pass. Views are amazing from here. You will take some pictures and start your downhill trek to Dingboche Village(4360m). 02.00pm: Arrive in Bibre(4570m) and continue the trek to Dingboche(4360m). 03.00pm: Arrive in Dingboche(4360m).Note: Rest and Relax at hotel. 06.00pm: Dinner at the hotel. 08.00 am: Wake up and prepare for breakfast. 09.30 am: Start downhill trek to Tenboche. Note: You have two option here. One is going directly to Shomare(4070m) and another one is via Pheriche(4280m). Via Pheriche is about 2 hour longer than direct way to Shomare. 11.30am: Arrive in Shomare. and continue the trek to Pangboche(3030m). 01.00 pm: Arrive in Pangboche(3930m). Lunch in Pangboche. 02.00pm: Start trek to Tengboche after lunch. 04.30pm: Arrive in Tengboche(3860m). Over Night in lodge at Tengboche. Note: Dinner in local lodge. Visit Tengboche Monastery on free time. Highlights: Visit the biggest village of the Everest region: Namche Bazar. 07.00 am: Wake up and prepare for breakfast. 08.00 am: Stat downhill trek to Namche Bazar. 11.30am: Arrive in Kyangjuma(3570m). Lunch in local lodge at Kyangjuma. 12.30pm: Start the trek to Namche Bazar after the lunch. 02.30pm: Arrive in Namche Bazar. Overnight in local lodge in Namche Bazar.Enoy the free and easy time by visiting NamcheBazar. Note: Dinner at the Lodge/hotel. Highlights: Amazing view of Mountains and final day in the mountain. 08.00 am: Start the downhill trek after breakfast to Hilary bridge for 1.50 hrs. 10.30 am: Arrive in Monjo (2840m) and continue the trek to Bengkar(2710m) for 30 minutes. 11.00 am: Arrive in Bengkar (2710m) and continue the trek to Toktok (2760m) for 30 minutes. 11.30 am: Arrive in Toktok (2760m) and continue the trek toPhakding (2610m) for 45 minutes. Lunch at Phakding(2610m). 01.00 pm: Start the trek to Ghat(2590m) for 1 hour. 02.00 pm: Arrive in Ghat (2590m) and continue the trek to Chheplung(2660m) for 30 minutes. 02.30 pm: Arrive in Chheplung (2660m) and continue the trek to Lukla for 1.5 hours. 04.00 pm: Arrive in Lukla (2840m) and check in hotel. Overnight in Lukla. 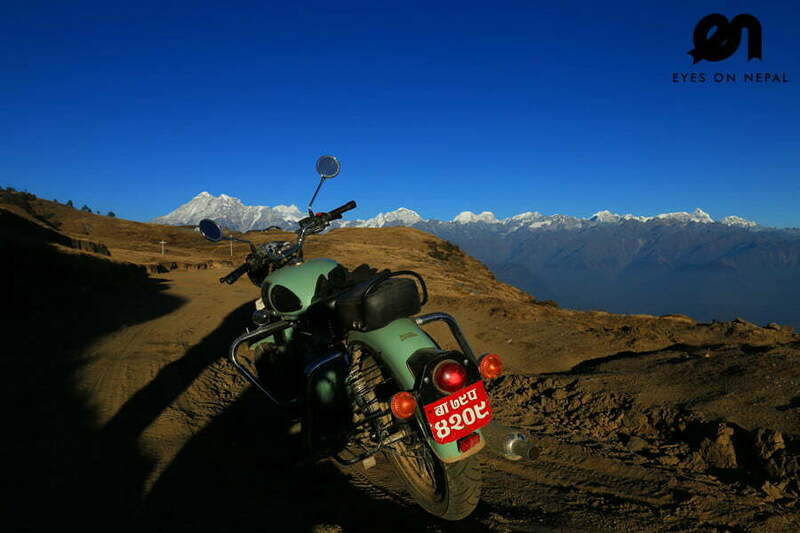 Highlights: Thrilling mountain flight to Kathmandu and amazing view of mountain and landscape. 05.30 am: Wake up and go to Lukla Airport to take the flight to Kathmandu. We expect to arrive in Kathmandu airport around 8.30am. 09.00 am: Pick up from Kathmandu Airport and drive to hotel. 09.30 am: Arrive in hotel, Check in. We will take you for the best bakery restaurant for the breakfast. Free and easy all day. 05.30 pm: Pick up from hotel for dinner. Note: today, we will take you to dine your choice of food. It is your party dinner after successful trek. Enjoy the dinner and drinks. 00.00hrs: Breakfast at hotel. Free & easy until transfer to airport. Both way transportations (To and from) the trekking starting/ending point using domestic flight (Tara, Goma, Sita or Simrik air). Domestic flight tickets from Kathmandu to Lukla. Include luggage 10kg and all government taxes and service charge. Domestic Flight ticket from Lukla to Katmandu. Include luggage 10kg and all government taxes and service charge. All necessary paper works, Sagarmatha National Park entry permitand Trekkers’ Information Management System (TIMS) Permit. Porters & Trekking Guides’ salaries, meals & accommodations. Sleeping bag, down jackets, walking stick, if necessary. All government taxes and service charge. Nepal entry visa fee (you may easily issue the visa upon your arrival at Tribhuwan International Airport Kathmandu). Extra night hotel accommodation if return early from trek or late departure. All the meal and accommodation in Pokhara and Kathmandu if you finished early your trek than our program. Tipping for the guide and porter. 50% upon Pick up in your hotel. Please note the itineraries are subjects to change. It always depends on the time available and weather conditions. Some of them can be cancelled without prior notice. No refund upon cancellation if it happened due to guests’ fault on dragging the time of visiting certain places or due to bad weather condition. Any change request will be charged accordingly.